They don’t make the music but ensure the instrument gets to its audiences. This London violinmaker created some of the most beautiful cases ever made. When is a package or container almost as valued as its contents? One imagines the Fabergé eggs as an incomparable embodiment and celebration of the exterior. On a much grander scale, some of the great concert halls of the world – the Culture and Congress Centre Concert Hall in Lucerne, the Boston Symphony Hall, Grosser Musikvereinssaal in Vienna, Berlin’s Philharmonie, the Tokyo Opera City Concert Hall, and the Christchurch Town Hall Auditorium (New Zealand) come to mind – are a type of packaging for the impressive music created within their walls. There are violin cases that are or were made to approximate the beauty and craftsmanship of the fine violins held inside. Before the advent of scientifically driven case details (humidity gauges and the like), there were the 12 Apostles Violin Cases made by the W.E. Hill & Sons shop in London. As the name implies, there were only a dozen made (on New Bond Street, noticeably in the neighborhood of the Fabergé shop), perhaps because few could afford the opulence and fine workmanship that went into building these cases. Lest anyone question the value of a case, which produces no music at all, consider the fact that one of the 12 Apostles sold at auction in 2016 for $17,220. The Hill family violin maker business, led by founder Willam Ebsworth Hill (1817-1895) existed for 105 years (1887-1992), but actually drew from a history of luthiers stretching back to Hill’s great grandfather. 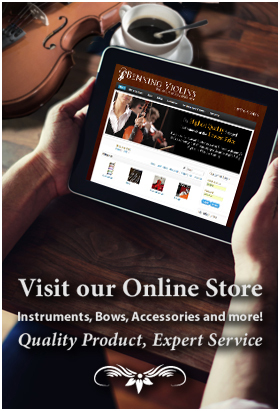 The firm made both violins and cellos, but was respected for its work in repairs, bows, fittings, identification and authentication, and ultimately, for fine case making. That workmanship included handmade locks and flush-bolts, a lined button (with cork) made to hold the bow, and intricate patterns of inlaid wood in musical motifs. All 12 are different – at least one case has its own covering of leather, a case over a case – and several have held violins by the fabled violin maker, Antonio Stradivarius. Such rich detailing on a case is not out of place, considering the time and place of the most accomplished violin, viola, and cello players of the day. Great concerts were attended by the higher echelons of society of the 16th, 17th, 18th and 19th centuries. Higher still were the courts and palaces where the most sought after musicians of the Victorian era – can you say Paganini? – would be hired to entertain private audiences. The etiquette of that time was excruciatingly precise; the arrival of the musician must clearly have been an observed and choreographed moment. 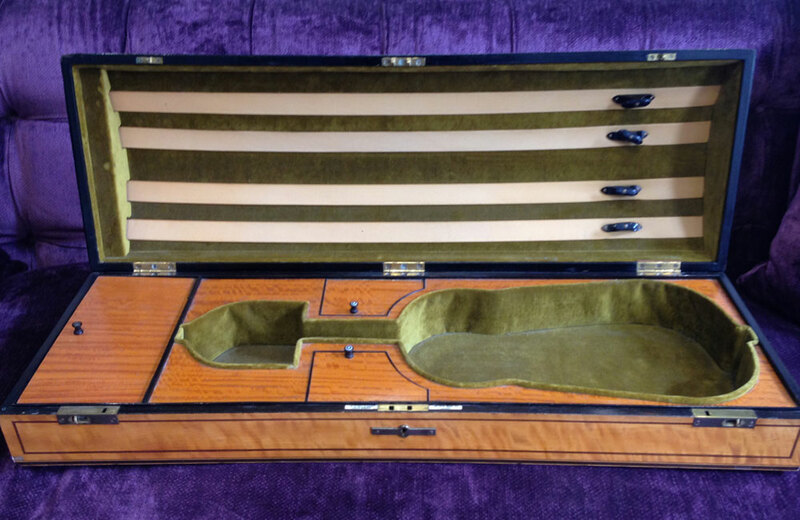 To be dressed in the finest of clothes might also require an exquisite violin case. Fine instrument cases, clearly the work of artists, do not have a catalogue raisonné as with the work of acclaimed visual artists. So the precise whereabouts of all of Hill’s 12 Apostles is not clear (based on an Internet search). The 2016 auction price might have raised the profile of this rarified group, sufficiently so such that any that are lost in an attic or orchestra hall storage room might turn up in the future.